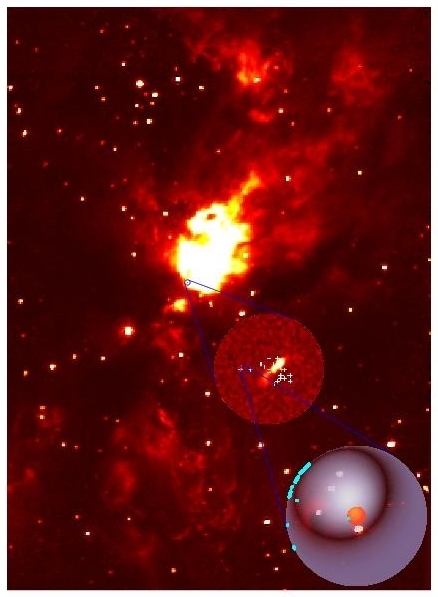 A young star more than 2,000 light-years away in the constellation Cepheus may be belching out spheres of gas, say astronomers who observed it with the National Science Foundation's Very Long Baseline Array (VLBA) radio telescope. Not only is the star ejecting spheres of gas, the researchers say, but it also may be ejecting them repeatedly, phenomena not predicted by current theories of how young stars shed matter. In order to remain stable while accumulating matter, young stars have to throw off some of the infalling material to avoid "spinning up" so fast they would break apart, according to current theories. Infalling matter forms a thin spinning disk around the core of the new star, and material is ejected in twin "jets" perpendicular to the plane of the disk. "Twin jets have been seen emerging from many young stars, so we are quite surprised to see evidence that this object may be ejecting not jets, but spheres of gas," said Paul T.P. Ho, an astronomer at the Harvard-Smithsonian Center for Astrophysics. The research is reported in the May 17 edition of the scientific journal Nature. 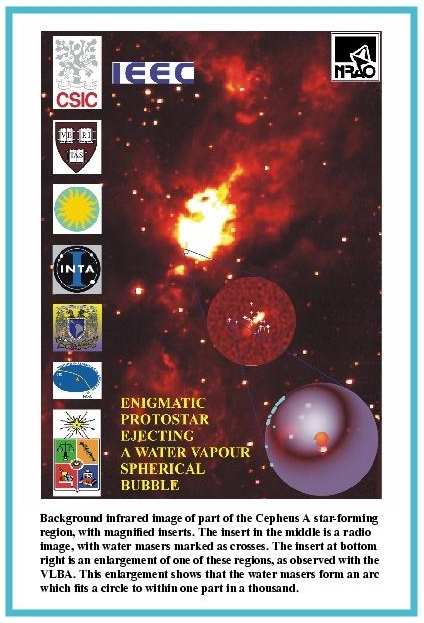 The astronomers observed a complex star-forming region in Cepheus and found an arc of water molecules that act like giant celestial amplifiers to boost the strength of radio signals at a frequency of 22 GHz. Such radio-wave amplifiers, called masers, show up as bright spots readily observed with radio telescopes. "With the great ability of the VLBA to show fine detail, we could track the motions of these maser spots over a period of weeks, and saw that this arc of water molecules is expanding at nearly 20,000 miles per hour," said Ho. "This was possible because we could detect detail equivalent to seeing Lincoln's nose on a penny in Los Angeles from the distance of New York," Ho added. "These observations pushed the tremendous capabilities of the VLBA and of modern computing power to their limits. This is an extremely complex observational project," said Luis F. Rodriguez, of Mexico's National Autonomous University. The arc of water masers can be fit to a nearly-perfect circle to within one part in a thousand. That, the researchers say, means that the water vapor in the arc most likely is part of a complete sphere. "The arc we see fits a circle so well that it is unlikely that any geometry other than that of a sphere would produce it," Ho said. The sphere would be about 1.5 times the size of the Solar System. Because the arc, and presumably the sphere of which it is part, is so thin and so uniform, the researchers say that it came from a single, short-lived ejection. In addition, other evidence suggests that the sphere from an earlier ejection now is being overtaken by a newer spherical bubble that took only about 33 years after being ejected to reach its observed size. "We now have at least one case, we believe, in which a young star has repeatedly ejected mass spherically in short bursts," Guillem Anglada, of the Institute of Astrophysics of Andalucia (CSIC), in Granada, Spain, said. "In light of our current understanding of star formation, we don't yet understand how this can happen, so we have an exciting new scientific challenge. It is surprising that nature can maintain such perfect symmetry, especially since the environment around the young star must be so varied. This appears to be a triumph of order over chaos," he added. The researchers, in addition to Rodriguez, Ho and Anglada, are: Jose M. Torrelles, Institute for Space Studies of Catalonia (IEEC)-Spanish Research Council (CSIC), Spain; Nimesh A. Patel and Lincoln Greenhill, of the Harvard-Smithsonian Center for Astrophysics; Jose F. Gomez, Laboratory for Space Astrophysics and Theoretical Physics of the National Institute for Aerospace Technology, Madrid, Spain; Salvador Curiel and Jorge Canto, of Mexico's National Autonomous University; and Guido Garay, Department of Astronomy of the University of Chile. The VLBA is part of the National Radio Astronomy Observatory. It consists of ten radio-telescope antennas, each 82 feet (25 meters) in diameter, spread across the U.S. from Hawaii to the U.S. Virgin Islands. Operated from Socorro, New Mexico, the VLBA provides astronomers with the greatest angular resolution, or ability to see fine detail, of any telescope on Earth or in space. The Center for Astrophysics combines the resources and research facilities of the Harvard College Observatory and the Smithsonian Astrophysical Observatory under a single director to pursue studies of those basic physical processes that determine the nature and evolution of the universe. Some 300 Smithsonian and Harvard scientists cooperate in broad programs of astrophysical research supported by Federal appropriations and University funds as well as contracts and grants from government agencies.